Having a manager of the calibre and the character of Louis van Gaal will be a great thing for the Premier League. But as well as raising the top flight’s entertainment levels, the Dutchman’s presence in the dugout will be a treat for opposition managers too. Gustavo Poyet is already looking forward to his first tactical duel and, thanks to the part his Sunderland side have played in Manchester United’s hefty fall from grace, he can head into it with more optimism than trepidation. Football fans worldwide rate van Gaal almost as highly as he regards himself. This year’s World Cup was a perfect stage for his talents. He started the summer by ripping up the 4-3-3 blueprint he was supposedly wedded to and taking up a 3-5-2 shape designed to paper over the cracks in his Netherlands squad. More than once the formation changed during a game, but it got his country to the semi-finals before losing on penalties to Argentina. But it was the previous round’s shoot-out which really cemented van Gaal’s maverick reputation. Bringing on Newcastle United’s Tim Krul – a goalkeeper, unlike Michel Vorn, with no pedigree to speak of from 12 yards – specifically for the spot kicks showed that second-guessing the former Barcelona and Bayern Munich boss is a futile exercise. 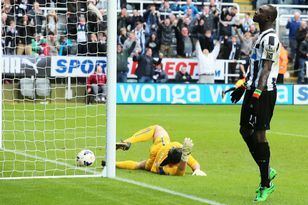 In the last four, Krul kept his seat on the bench. Poyet is preparing himself for another tactical curveball at the Stadium of Light tomorrow afternoon. “He’s very intelligent and he knows the game,” commented Poyet, who has never come up against van Gaal as a player or coach. “Depending how the game goes, he is going to make a move. I need to be ready and to know what he is trying. It is like a little game between us. His notorious arrogance, like his inability to suffer fools gladly, might not make van Gaal the most popular manager in England’s top-flight, but he is certainly one Poyet, as an aspiring young coach, admires. Once upon a time, taking on Manchester United was something to be feared. Until last season, Sunderland had not won at Old Trafford since George Best, Bobby Charlton and Dennis Law were at their peak. But in burying the ghosts of 1968, Sunderland smashed down a psychological barrier. Adnan Januzaj might have rescued a Stadium of Light win for the Red Devils, but three matches since have ended badly for what was once England’s all-conquering side. A 2-1 League Cup win in January might have been reversed in the semi-final second leg at Old Trafford, but instead of saving face, Javier Hernandez’s 120th-minute winner only set his side up for more heartbreak in the ensuing penalty shoot-out. In May Sunderland became the first – and to date last – club to inflict defeat on Ryan Giggs the manager. The Black Cats, then, have nothing to fear from a beast wounded by an opening home defeat to Swansea City – excpet perhaps complacency. “I don’t think about it that way,” responds Poyet when asked about the weight off his team’s shoulders. “But everyone is talking about that. When you cannot beat a team, everybody says ‘we cannot beat them, we need to change that’. They keep talking about ‘we cannot’ and ‘we need to change that’. “Now we’ve done it, we need to watch for over-confidence. “It’s a different feeling. I think it’s a better feeling. I went to Old Trafford with Chelsea a couple of times really confident that we’d have a chance, I don’t think we lost to them, but then I went there with Tottenham and we couldn’t win in the past and we didn’t win then. “If we have got that (positive) mentality in the team, I am sure it is going to help. “People are thinking that we need to beat West Brom, QPR and Burnley, because the other (opening) games are Man Utd and Tottenham. But for us, it is the same three points this weekend and next weekend. Especially at the beginning of the season, you cannot plan which teams you are going to take points off.